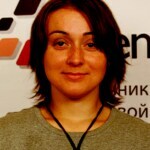 Kiev – Ukrainian journalist Iryna Volkonskaya (Ирина Волконская) published on the Ukrainian website Golos.ua, an opinion column, in which she predicts how she thinks the Jews will take control of her country. The column analyzes in detail, step by step, its forecast for the takeover of Jewish populations throughout Ukraine. According to her column, she is worried that Israeli Jews are traveling in large numbers to Ukraine to pray. In her opinion, this is the beginning of a huge settlement of Jews in the Ukraine. “At first they will settle in a small area, and then they will spread in all directions,” says Volkonskaya. “Initially these will be land, then retail chains and then banks. “Then, the Ukrainians will become the workers of the Jews, because with an education system like we have you can’t get advanced positions,” predicts the journalist, and promises to gather meetings in all communities to discuss how to prevent this takeover.